I was engineered for war. As an elite soldier of the Blended Coalition, I go where they tell me. I don’t ask questions. The mission. That’s all there is. But somethin’s changing’. Gods and magic? That skrit makes my head hurt. Things aren’t what I fraggin’ thought they were—or was told. Turns out the Coalition is rotten from the inside. Orders don’t make sense. I feel doubt in my gut. Now I’m stuck, tryin’ to decide what to do. After reading (and loving!) the first two books in the Shardwell Series, I was dying to get my hands on Child of Stone. Gerry and Hall didn't disappoint. 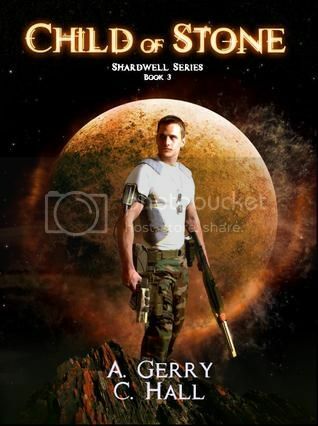 The first book is set in present day Earth, the second is set some time earlier in a fantastical "shard" of princes and princesses, Child of Stone is based sometime in between in galactic setting, which I'm not usually a fan of, but Gerry and Hall are a couple of geniuses. This is where we finally get Kyle's story. Lance Kyleren is a "blended" - which means that he was basically created to be the elite of the elite soldiers. The Coalition is at war and Lt. Lance Kyleren is part of the mission sent to cripple the enemy when impossibly a woman materializes on his ship. This beautiful, feisty woman, turns out to none other than Margariete, who was somehow separated from Raelyn when entering the shard in search of Esilwen. True to their story, Margariete and Kyleren hate each other... at first (you gotta love a love/hate story). The mission gets derailed, Esilwen and Kirion turn out to both be in this shard, there's fighting, magic, gods and goddesses, and elves, and all set in the galactic world - I never would have thought that could work, but it does! Once again, I don't want to ruin the book for anyone that hasn't read it because truly it's an amazing series. So without giving away too many details I'll say this: Gerry and Hall have an uncanny ability to create amazing worlds and take you into them. What started out as seemingly slightly different/talented teenage kids have turned out to be so much more. The world they have unfolded, the elements they're able to bring together, the characters they have created is all just ... I mean... it's... they're awesome. Ladies - please hurry with the 4th book! I'm dying over here! A. Gerry developed an interest in fantasy at a young age. In middle school, she fell in love with writing short stories and was thrilled when her sister proposed creating a series of novels together. Her fondness of writing comes from many sources, but the most prominent is her avid devotion to video games. Some of her favorites include Mass Effect, The Elder Scrolls series, and anything that lets her shoot zombies. She received a Bachelor’s Degree from Southern Utah University and teaches at a local charter school. C. Hall has been addicted to the many realms of fantasy and science fiction all her life. She joined her first peer writers’ group in the sixth grade, joyfully sharing world building at a young age. A graduate of Southern Utah University, she now teaches at a local charter school. When she isn’t busy designing activities for her Mythology class or going on field trips with the Star Wars Club, she is spending time with her sister, A Gerry. C. Hall’s favorite authors include J.R.R Tolkien, J.K. Rowling, and Tracy Hickman.